I know it's only September, and this has been going on since the end of August! But really, is it ever too early for music, food and entertainment? I didn't think so, and neither do our most northern friends at Snowbird. Clicky here for a pdf of all the activities. The schedule is every weekend until October 10th, but you'll want to get up there before that Utah chill hits. It's a mixture of free and not so free activities. 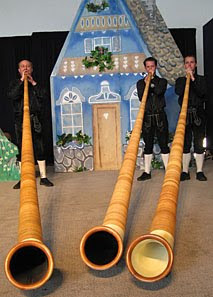 The scenery will be gorgeous, and if you hop the tram you can enjoy an Alphorn performance (you know, those huge, crazy, RIIIIICOLA! horns?). See the pdf for details, pack the kids up for the drive and spend a day celebrating German heritage! So what if it isn't yours, the Bavarian foods just might make you change your genealogy!